This past Sunday was our third anniversary. Jordy and I have spent the last three months together, though it actually feels more like three years. I was forewarned of his potential issues, but my little Mango Monkey (he gets that nickname based on the way he smells after a bath) has done nothing short of constantly amaze me with his resiliency and ability to adapt. The best part of it all is seeing his true personality start to shine now that he’s become truly comfortable with his “mommy”. Jordy loves to wake me up just moments before my alarm with a few kisses and some burrowing under my pillow. He truly loves to cuddle. Surprisingly, he does well with kids and is even gentle with sweet Sienna-bear. Jordy can’t get enough peanut butter and knows the Jif jar when I bring it out of the cupboard without a word. The little guy plays somethin’ fierce with his squeaky toys and shows no shame in farting around me – a lot. Few people know this about him, but sadly, his first owner had him de-barked as a very young puppy. The sounds he made when he first came into my home were nothing above a whimper, but now he really tries to communicate with his voice and he’s built up quite a sound for himself. It’s my hope that he’ll learn to truly bark once again. And lastly, if you’ve met Jordy, you know he’s an introverted dog. He’s not afraid of other dogs, but initially he never, ever interacted with them. 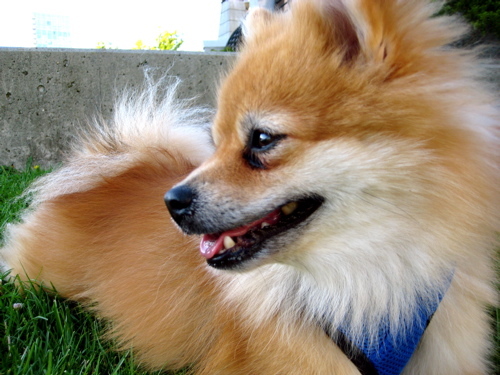 We’ve been visiting dog parks several times a week and even found one that tends to be frequented by other pomeranians. Very cautiously he’s beginning to leave my side to go and interact, and I have no doubt he’ll be running and rolling on the grass with the rest of them in no time! I can’t even begin to tell you how much joy he brings into my life on a daily basis and how lucky I feel to have found him. 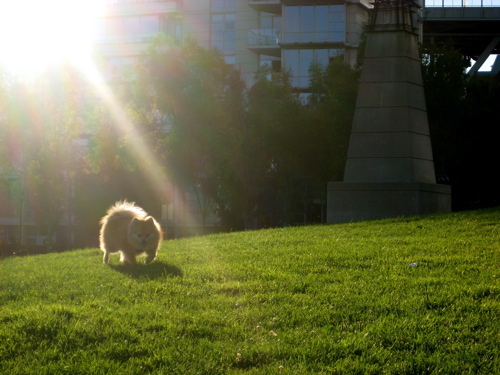 Check out Jordy’s set on Flickr for more pictures snapped last night at the park. Your little golden boy is so handsome…love the set of photos on Flickr. He is so photogenic! Congratulations on your 3 months! I cannot imagine any dog owner actually de-barking their dog. That just breaks my heart to thimk people can be so cruel. Jordy is lucky to have you Keira-Anne. I find this video HALARIOUS!…. 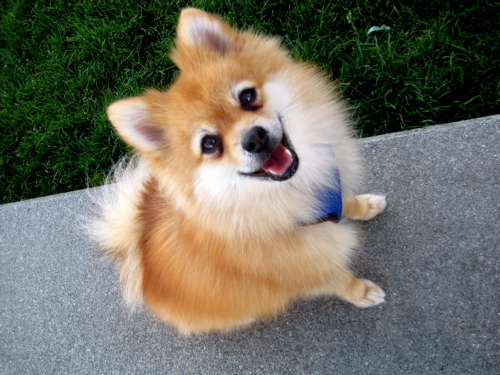 hehe… he’s one HUGE pomeranian! and the bum sniffing is sooo funny. oh dogs… they are such fun! I know you remember when I first heard his ‘sound’, I got teary-eyed…but boy that’s not getting in his way, so happy to see him getting into playtime with his peeps! Happy 3 months darlin! Debarked?? What a cruel and horrible thing to do. Thank goodness Jordy now has someone like you who will never hurt him. so cute! i have two small dogs–both rescued. i should do a post on them soon. I clicked on the debarking article, as I’ve never heard of that procedure before, and wow. I cant’ believe that someone would actually argue FOR that, saying it’s a ‘life-saving’ procedure. So wrong. Congrats on your 3 months! Jordy is gorgeous! Dont you ever wonder what your life was like before… actually scratch that..
Live in the now.. he looks sooooooo awesome! Jordy looks so happy in these pics.